The shortest Connection between the Hands and the Feet is the Ear. 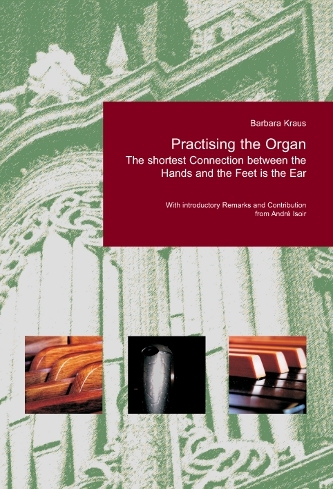 This book is intended for use by all who are professionally involved with organ playing: organ students, organists and organ teachers. "Practising the Organ" is divided up into diverse sections corresponding to diverse physical as well as mental aspects of professional organ playing. Using examples from representative Baroque, Romantic and Modern organ literature, short passages have been taken out exemplifying typical technical or mental difficulties and used to demonstrate how to overcome them. As in a reference book, these exercises may, after closer examination of the core of a problematic passage, be transferred directly onto analogue passages of the same or another piece. In the author’s experience, these techniques can greatly reduce practising time and, through the continually varying ways of activating listening and memory-skills, lead to continual development of mental conception thus heightening as well as refining one’s will for expression. 138 note samples, 92 p.
"Practising the Organ" is a terrific foray into the art of practicing and a helpful, informative technical 'how-to' resource. Although perhaps most valuable for aspiring organists and students, even mature players would find in its pages food for thought and help in figuring out why that difficult passage continues to be elusive ... How I wish I had this book during my formative years!" "This book is an invaluable "console-side" resource for organists of all levels." "… Interesting variations on practical exercises in unison with training of absolutely critical listening skills …. The subtitle of the book – “The shortest connection between the hands and the feet is the ear” – sums it up… a new and refreshingly non-ideological book."